My mother would be turning in her grave, except that she's alive. So instead, she's rolling her eyes: all that education, vocabulary, writing experience, and I come up with the word "amazeballs"?! Just so you know, Mom, it could have been "amaaahzing" or "fantabulous" as well. The point is, sometimes the words I use to describe something incredible, awesome, wonderful, or simply unbelievable are ridonkulous, and not terribly proper. The same is true in French. More true, perhaps. With a limited vocabulary when I first move here, I start off declaring everything "incroyable" (incredible) when I am "choquée" (shocked). But I learn as I go along the more native way to express amazement, and it's a whole lot less clinical and more fun. The ones I hear the most often are "hallucinant" (think: "I must be hallucinating!") and "bluffant" (think: "You must be bluffing! "), probably because they're both used to describe that feeling when you just cannot believe how stupid, crazy, weird, or illogical something is. It's the "You've got to be kidding me!" of amazings. Needless to say, there are plenty of opportunities to use this one -- like when I see these stuffed pigs in a book shop window. What the ...?! I must be hallucinating. Less common, and more of a tongue twister: "époustouflant" which more literally means "stupefying" or "mind-boggling". And a couple favorite related phrases: "je suis scotchée!" Of course if you're a guy saying it, then just one E would do. It means "I'm struck!" or "I'm impressed!" but colloquially works more like "I'm blown away!" I can't figure out where it comes from, since the French word "scotch" means "Scotch tape". And "je suis bouleversée" (again, two Es at the end because I'm a female saying it) -- means almost literally "I'm bowled over". You can be physically run over, or simply bowled over by a concept -- generally some form of stupidity of tremendous proportions. This seems to happen frequently enough that I hear these phrases quite often. 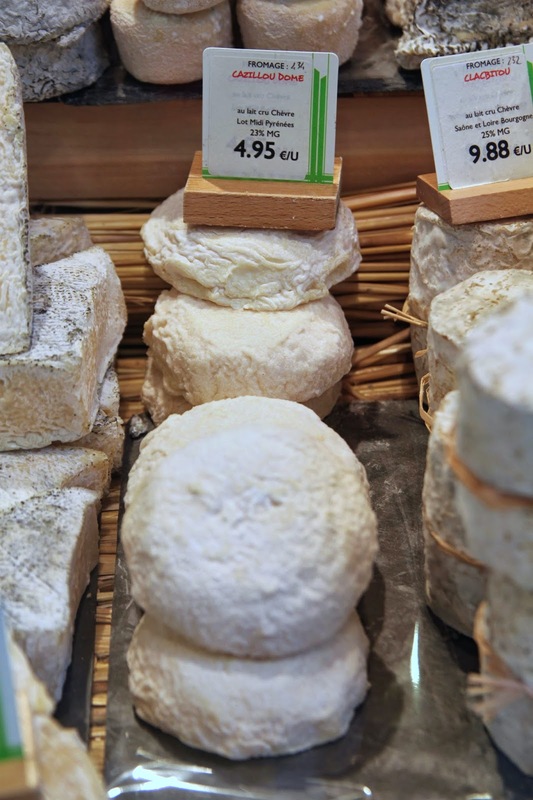 Cazillou Dome is a raw goats' milk cheese that hails from Lot in the Midi-Pyrénées. There is so little known or advertised about this cheese, it's rather stupefying. It does not hail from a town named Cazillou, but at least it's a dome. The only place I've ever seen or heard of it, let alone found and bought it, is at the Pascal Beillevaire shops. It's a perfect goat cheese -- wet and oozy on the outsides, creamy on the inside, salty and tangy. It's about the diameter of a CD (remember those?) which seems like enough to share among friends, but you will probably want it all to yourself. First of all, the Cazillou Dome is vaguely ball-ish shaped, but what makes it really amazeballs is the texture and the taste. We're scotchés. Completely bouleversés. Such an addictive cheese, it's époustouflant; it's the one on the platter that everybody wants to devour, which is why I can't even manage to snap a photo of the insides. The kids try to gobble it up without even giving us a taste, which is the kind of thing I call bluffant and hallucinant.